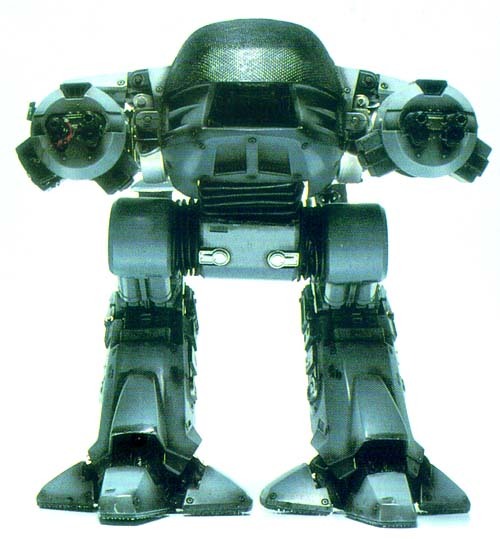 Top of the line security/enforcement droid from Weylan-Yutani Corporation. Standard loadout includes a deadly array of military weaponry, and a plasma-shock array for use against those who attempt to engage it in melee combat. Standard Armaments: 2 x C-141A Shredder; 2 x K-12 Punisher Quad Rocket Launcher. Traits: Absolute Direction; AI; Automaton; Cannot Float; Danger Sense; Doesn't Breath; Electrical (Hardened, +8); Enhanced Time Sense; Extra Attack 2; High Pain Threshold; Hyperspectral Vision; Indomitable; Machine; Nictitating Membrane 50; No Fine Manipulators; No Sense of Taste/Smell; Peripheral Vision; Pressure Support 2; Protected Senses (Hearing, Vision); See Invisible (Detector Unit)*; Sealed; Static (Psi)*; Unfazeable; Vacuum Support. Skills: Artillery (Guided Missile)-16; Gunner (Cannon, Machine Guns, and Rockets)-22; Electronics Operation (EW, Sensors)-16.